The mill and stone bridge near the intersection of Rt. 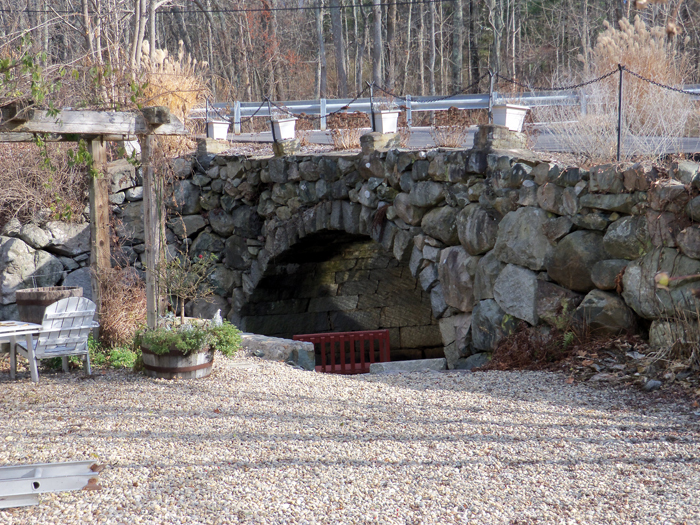 1 and Glen Street in Rowley are replicas of the first fulling mill and stone arch bridge in America. In 1930, the Massachusetts Bay Colony Tercentenary Commission erected a marker at the site commemorating its historical significance. After Nelson died in 1648, John Pearson made improvements and operated this mill as well as another one nearby in Byfield. Pearson arrived in Ipswich in 1643 from Yorkshire, England and within three months had moved to Rowley. His original house lot was on Holme Street (now Center St.) just north of the original meeting house. 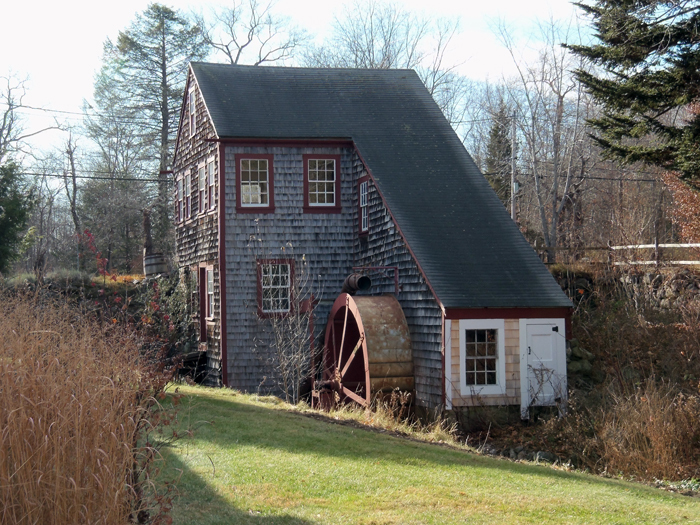 He brought with him from Yorkshire the machinery for the mill, which he set up on the Mill River at or near the grist mill that had been established by Philip Nelson two or three years before. The Jewel Mill on Glen Street sits on the foundation of John Pearson’s fulling mill. The Glen Mills Cereal Company operated at this site in the late 19th Century. Paul Parker bought the site in 1942 and constructed this replica mill with a 12 ft. overshot water wheel. This was the first fulling mill in the American English colony. Local families made cloth in their homes and brought it to the Pearson Mill to be fulled (shrunken and dressed). Because of this, Rowley is the birthplace of the American woolen industry. The English wanted to be the sole supplier of spun wool to the Colonies, and sanctions were imposed for buying Rowley wool. As late as the 1800’s, wool was taken here to the mills of Samuel and Joshua Dummer to be carded. 1830 map of Rowley showing the Pearson and Dummer mills at this location. The stone arch bridge is not indicated, first appearing in the 1872 map. John Pearson has been called the “father of the milling industry” in America.Two of Pearson’s ledgers for the years between 1672 and 1688 are preserved and show that 64,087 yards were processed during that period. The ledgers contain accounts with 618 individuals from throughout Essex County, suggesting a virtual monopoly of the fulling industry in the early years. Grist mills soon followed. Pearson served as moderator of town meetings, selectman and assessor, and represented Rowley to the General Court in Boston. In 1687 he and several leaders of Ipswich were imprisoned for two weeks for resisting the edicts of Governor John Andros. Next to this mill building is the Pearson-Dummer house built in 1714. 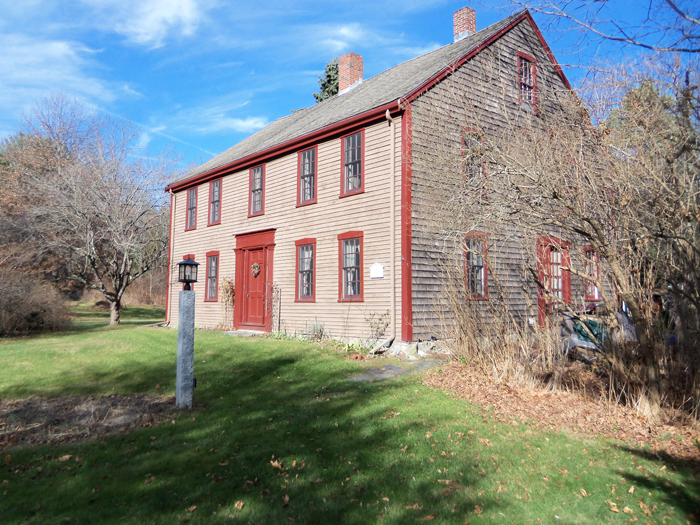 Samuel Dummer purchased the house in 1817 and operated the mill. 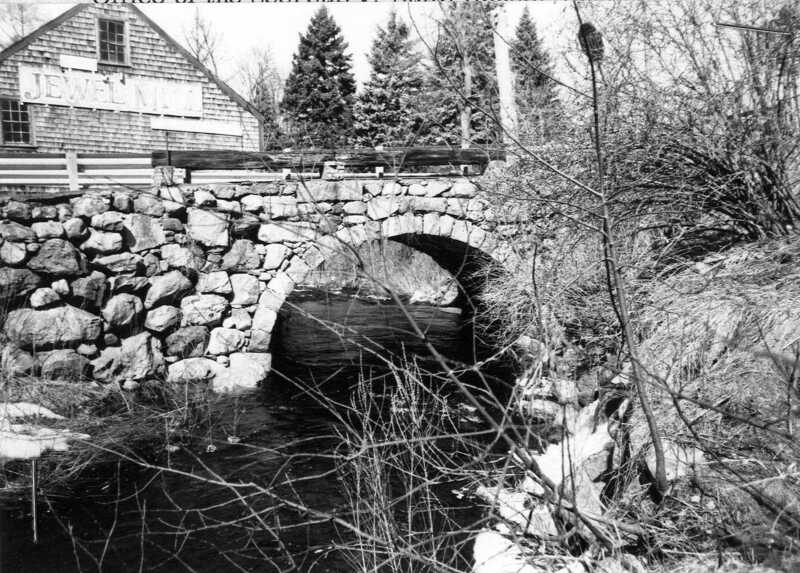 The Glen Mill stone arch bridge on this property (also known as the Jewel Mill Bridge) is at the site of what some ssay was the first stone arch bridge in North America, built by Richard Holmes in the 1640’s, but a search of town records provides no evidence of AN early stone arch bridge. The short private drive known as Mill St. is probably a road that was discontinued when the Newburyport Turnpike was constructed in 1805. This replica bridge is believed to have been constructed after publication of the 1856 map but before the 1872 map, which is the first to show a bridge at this location. The arch of the current bridge is laid with commercially quarried granite split using the “plug and feather” system of splitting stones that came into popular use around 1800. Ipswich has four stone arch bridges. The 1764 Choate Bridge is the oldest surviving double arch bridge in the country. It was expanded in 1838 and restored in 1989. Double arch bridges carry traffic on Green Street and County Street, and the impressive triple-arch Warner Bridge spans Mill Road, connecting to Hamilton. Philadelphia’s triple-arch Frankford Avenue bridge over the Pennypack Creek was built in 1697 and thus takes the honor of being the oldest stone arch bridge in America. 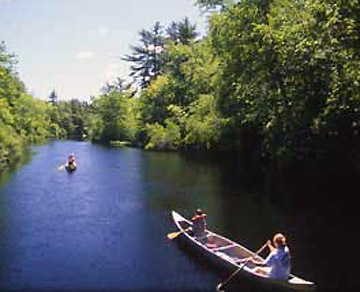 In 2003 owner Cheryl Forster received an appropriation of $15,000 from the Town of Rowley to do renovations to the Water Wheel and conduct a structural assessment. The mill and bridge are on private property, but can be viewed from Rt. 1 or more easily from Mill Road, which comes off Glen Street near Rt. 1.